Plasmablastic lymphoma (PBL) is an uncommon large cell lymphoma initially described in 1997 by Delecluse et al. predominantly affecting human immunodeficiency virus (HIV) infected or immunodeficient males. They constitute 2%–3% of lymphomas in HIV positive individuals, but their exact prevalence in HIV negative individuals is not known. They are predominantly seen in extranodal sites especially oral cavity, but are also reported in various mucosal sites, skin, soft tissue, bone, and rarely in lymph nodes  with bone marrow involvement in 30% of the cases at diagnosis. However, primary presentation in bone marrow is distinctly rare with only a single case report in the literature. The diagnosis of PBL is not straightforward and is complicated by the variability in the morphology, immunophenotype, and the overlap in morphological and immunophenotypic features with several other lymphomas with plasmablastic differentiation. Here, we report a rare case of PBL primarily diagnosed from bone marrow and discuss the approach and possible diagnostic pitfalls in such cases. A 38-year-old male with no significant co-morbidities presented with a history of low-grade fever and weight loss of 2 months duration. Initially, he was found to have thrombocytopenia (100 × 109/L) with positivity for dengue IgG antibody. The patient was managed conservatively; however, he continued to have fever with progressive anemia (hemoglobin – 65 g/L) and thrombocytopenia (platelet count – 30 ×109/L). He underwent a bone marrow examination at a local hospital, the findings of which were suggestive of infiltration by a high-grade malignancy. 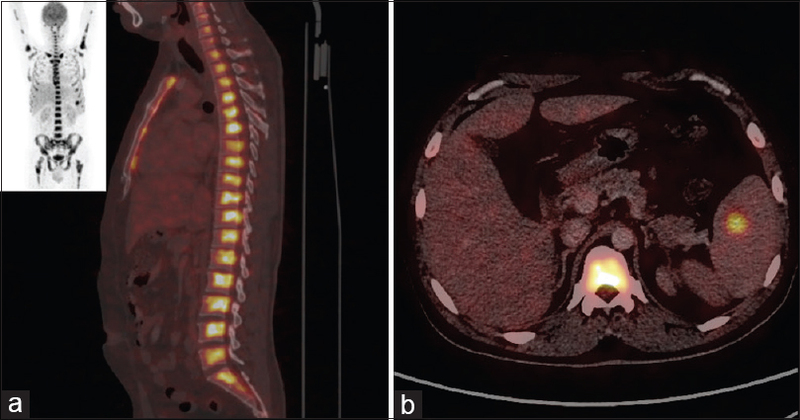 In view of the abnormal findings, an 18 F-FDG PET-CT scan of the whole body was done which showed heterogenous FDG uptake (SUV Max 10.1) in the bone marrow of axial and appendicular skeleton, a metabolic active hypodense lesion in spleen (20 × 18 mm size) low-grade metabolic active sub-centimetric abdominal lymph nodes (SUV max 2.8) [Figure 1]. He was referred to our hospital for further evaluation and management. The physical examination was unremarkable except for pallor. Investigations revealed anemia (hemoglobin – 65 g/L), thrombocytopenia (platelet count – 44 × 109/L), hypoalbuminemia (total protein – 6.2 g/dL, albumin – 2.76 g/dL), elevated LDH (2900 U/L, normal range 140–290 U/L) and elevated beta-2 microglobulin (4132 ng/mL). He was seronegative for human immunodeficiency virus (HIV), hepatitis B surface antigen, and hepatitis C virus (HCV). The peripheral blood smear showed an occasional large atypical cell. A repeat bone marrow examination was performed in our center. Bone marrow aspirate smears were cellular and showed 40% large atypical cells. Normal hematopoietic cells were proportionately represented and showed normal maturation. The biopsy showed large areas of necrosis with preserved areas showing diffuse infiltration by large atypical cells [Figure 2]. The flow cytometry sample was not representative, possibly due to aspiration from necrotic areas. The differential diagnoses kept at this stage were leukemia, high-grade lymphoma, and poorly differentiated non-hematopoietic malignancy. On immunohistochemistry, these cells showed membranous positivity for CD45, CD138, CD38, CD30, and EMA immunostains. These cells were negative for CD3, CD5, CD7, CD20, CD79a, CD34, CD56, kappa light chain (polyclonal), lambda light chain (polyclonal), CD117, CD68, Alk-1, MUM-1, and MPO immunostains. Serum protein electrophoresis and immunofixation failed to reveal monoclonal protein. There were no lytic lesions on the skeletal survey. Epstein–Barr virus encoded RNA (EBER) in-situ hybridization was negative. There was no significant lymphadenopathy or any other obvious primary malignant lesions. Splenic space occupying lesion could not be further investigated due to thrombocytopenia. A diagnosis of PBL (possibly primary) of bone marrow was made. The patient was started on dose-adjusted EPOCH chemotherapy along with brentuximab vedotin (in view of CD30 positivity). After the first cycle, the patient showed normalization of hemogram findings (hemoglobin 118 g/L, total leukocyte count 4.8 × 109/L, platelet count 382 × 109/L). The second cycle of chemotherapy was also administered and the patient was discharged in a hemodynamically stable condition. However, the patient developed progressive cytopenias, did not come for regular follow up, and died due to progressive disease 6 months after diagnosis. In our patient, in view of clinical presentation (primary bone marrow involvement) and morphology, the important differential diagnoses considered were acute leukemia, large cell lymphoma, and anaplastic/plasmablastic myeloma. An acute leukemia was excluded based on the results of the initial panel of immunohistochemistry (CD45pos, CD20neg, CD79aneg, CD3neg, CD7neg, CD68neg, CD117neg, anti-MPOneg, CD34neg). 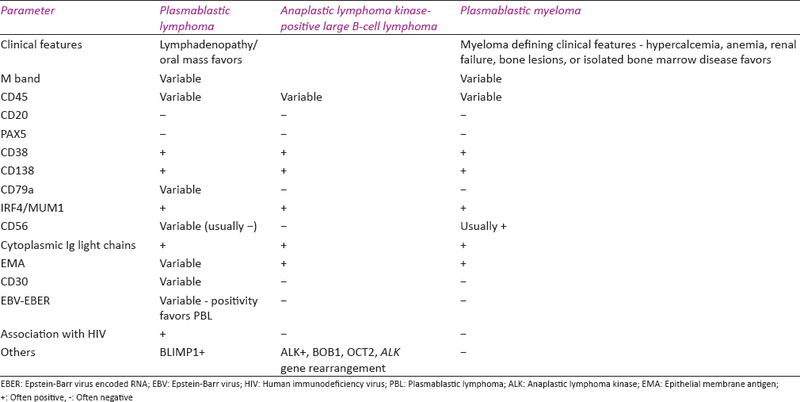 The differential diagnosis was further narrowed to PBL, plasmablastic myeloma, and ALK-positive large cell lymphoma based on immunophenotype positivity for CD138, CD38 and negativity for CD20 [Table 1].,, A further panel of immunohistochemistry showed positivity for CD30, EMA, and negativity for MUM-1, ALK, CD56, and cytoplasmic immunoglobulins. The possibility of anaplastic large cell lymphoma-null cell type (CD45pos, CD3neg, CD7neg, CD30pos, EMApos) was not considered due to strong positivity for CD138; however, it is to be highlighted that the absence of CD138 and CD38 in the immunohistochemistry panel would have led to a misclassification as anaplastic large cell lymphoma-null cell type. The negativity for ALK excludes the diagnosis of ALK-positive large B cell lymphoma. EBER in-situ hybridization was negative though EBV IgM was positive. A diagnosis of plasmablastic myeloma appeared less likely in view of the absence of most of the myeloma associated features (hypercalcemia, lytic bone lesions, renal dysfunction, monoclonal proteins on immunofixation, lack of cytoplasmic immunoglobulins, and negativity for CD56). Finally, a diagnosis of PBL was kept irrespective of certain odd findings such as CD45 positivity, absence of cytoplasmic immunoglobulins, and negativity for EBV. These aberrancies have been reported in variable number of cases of PBL. Absence of cytoplasmic light chain in immunohistochemistry can be due to issues with tissue fixation; but can also be due to the inability of antibody to detect truncated/altered immunoglobulins expressed in clonal B cells; or due to low level of expression of immunoglobulins in the clonal B-cells. In a series of PBL cases published previously, only 47% of the cases demonstrated light chain restriction. EBER in-situ hybridization is reported to be positive in 100% of cases with HIV positive cases but only in 60%–75% of HIV negative cases. BLIMP1 and XBP1 are other immunohistochemical markers shown to be positive in cases of PBL. Though the genomic profile of PBL has been shown to resemble diffuse large B cell lymphoma rather than myeloma, there are a few conflicting reports which have shown its similarity to extra-osseous plasmacytoma showing the heterogeneous nature of the disease. The prognosis of PBL appears to be generally poor with 3-year survival of only 40% but there is only sparse data in HIV-negative patients. The median overall survival of PBL was found to be 32 months in one of the largest published series. Several aggressive therapeutic regimens have been used in the literature with occasional cases showing prolonged survival.,, Being CD20 negative, they do not benefit from anti-CD20 monoclonal antibody-based therapy; however may benefit from anti-CD30 monoclonal antibody-based therapy in PBL cases expressing this antigen. Hematopoietic stem cell transplantation is an upcoming option in patients with relapsed or refractory disease. However prospective clinical trials are needed for demonstrating a therapeutic benefit and developing a consensus in management, which is practically difficult owing to the rarity of the disease. To summarize, we report a rare case of primary PBL of bone marrow, the diagnosis of which is complicated by the overlapping morphology and immunophenotype with several large cell lymphomas and plasma cell neoplasms and showing an initial dramatic response to anti-CD30 monoclonal antibody-based therapy. The inclusion of markers of plasmablastic differentiation in the diagnostic panel of large cell lymphomas is essential to avoid misclassification of this rare lymphoma. Al-Malki MM, Castillo JJ, Sloan JM, Re A. Hematopoietic cell transplantation for plasmablastic lymphoma: A review. Biol Blood Marrow Transplant 2014;20:1877-84. Tchernonog E, Faurie P, Coppo P, Monjanel H, Bonnet A, Algarte Génin M, et al. Clinical characteristics and prognostic factors of plasmablastic lymphoma patients: Analysis of 135 patients from the LYSA group. Ann Oncol 2017;28:843-8. Swerdlow SH, Campo E, Harris NL, Jaffe ES, Pileri SA, Stein H, et al., editors. WHO Classification of Tumours of Haematopoietic and Lymphoid Tissues. Revised. 4th ed. Lyon: IARC; 2017. p. 321-2. Dittus C, Sarosiek S. A case of HIV-negative plasmablastic lymphoma of the bone marrow with a unique immunophenotype. Clin Case Rep 2017;5:902-4. Hsi ED, Lorsbach RB, Fend F, Dogan A. Plasmablastic lymphoma and related disorders. Am J Clin Pathol 2011;136:183-94. Castillo JJ, Reagan JL. Plasmablastic lymphoma: A systematic review. ScientificWorldJournal 2011;11:687-96. Qunaj L, Castillo JJ, Olszewski AJ. Survival of patients with CD20-negative variants of large B-cell lymphoma: An analysis of the national cancer data base. Leuk Lymphoma 2018;59:1375-83. Pan Z, Hu S, Li M, Zhou Y, Kim YS, Reddy V, et al. ALK-positive large B-cell lymphoma: A Clinicopathologic study of 26 cases with review of additional 108 cases in the literature. Am J Surg Pathol 2017;41:25-38. Vega F, Chang CC, Medeiros LJ, Udden MM, Cho-Vega JH, Lau CC, et al. Plasmablastic lymphomas and plasmablastic plasma cell myelomas have nearly identical immunophenotypic profiles. Mod Pathol 2005;18:806-15. Ahn JS, Okal R, Vos JA, Smolkin M, Kanate AS, Rosado FG, et al. Plasmablastic lymphoma versus plasmablastic myeloma: An ongoing diagnostic dilemma. J Clin Pathol 2017;70:775-80. Morscio J, Dierickx D, Nijs J, Verhoef G, Bittoun E, Vanoeteren X, et al. Clinicopathologic comparison of plasmablastic lymphoma in HIV-positive, immunocompetent, and posttransplant patients: Single-center series of 25 cases and meta-analysis of 277 reported cases. Am J Surg Pathol 2014;38:875-86. Weiss LM, Loera S, Bacchi CE. Immunoglobulin light chain immunohistochemistry revisited, with emphasis on reactive follicular hyperplasia versus follicular lymphoma. Appl Immunohistochem Mol Morphol 2010;18:199-205. Boy SC, van Heerden MB, Raubenheimer EJ, van Heerden WF. Plasmablastic lymphomas with light chain restriction – Plasmablastic extramedullary plasmacytomas? J Oral Pathol Med 2010;39:435-9. Montes-Moreno S, Gonzalez-Medina AR, Rodriguez-Pinilla SM, Maestre L, Sanchez-Verde L, Roncador G, et al. 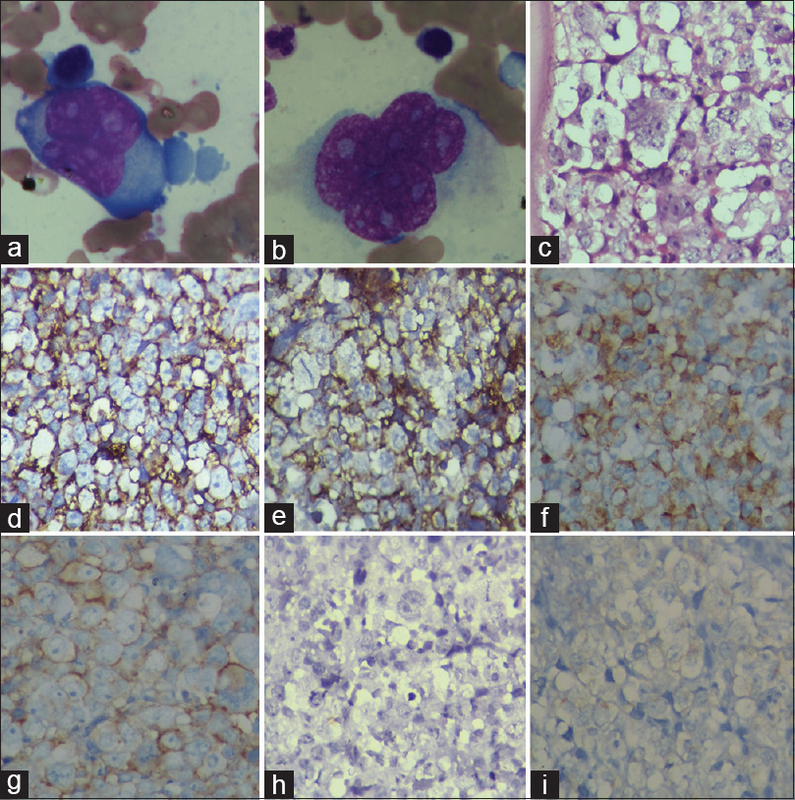 Aggressive large B-cell lymphoma with plasma cell differentiation: Immunohistochemical characterization of plasmablastic lymphoma and diffuse large B-cell lymphoma with partial plasmablastic phenotype. Haematologica 2010;95:1342-9. Rafei H, El-Bahesh E, Finianos A, Liu ML, Schechter GP. Plasmablastic lymphoma: Case report of prolonged survival of an advanced human immunodeficiency patient and literature review. Case Rep Hematol 2017;2017:9561013. Bibas M, Castillo JJ. Current knowledge on HIV-associated plasmablastic lymphoma. Mediterr J Hematol Infect Dis 2014;6:e2014064. Yanamandra U, Sahu KK, Jain N, Prakash G, Saikia U, Malhotra P, et al. Plasmablastic lymphoma: Successful management with CHOP and lenalidomide in resource constraint settings. Ann Hematol 2016;95:1715-7. Holderness BM, Malhotra S, Levy NB, Danilov AV. Brentuximab vedotin demonstrates activity in a patient with plasmablastic lymphoma arising from a background of chronic lymphocytic leukemia. J Clin Oncol 2013;31:e197-9.